The American West of the 1930s and 1940s was still a place of prospectors, cowboys, ranchers, and mountaineers, one that demanded backbreaking, lonely, and dangerous work. Still, midcentury pioneers such as David Lavender remembered “not the cold and the cruel fatigue, but rather the multitude of tiny things which in their sum make up the elemental poetry of rock and ice and snow.” And as the nation exhausted its gold and silver veins, as law reached the boomtowns on the frontier, and as the era of the great cattle ranches and drives came to an end, Lavender felt compelled to document his experiences in rugged southwest Colorado to preserve this rapidly disappearing way of life. One Man’s West is Lavender’s ode to his days on the Continental Divide and the story of his experiences making a living in the not so wild but not yet tamed West. 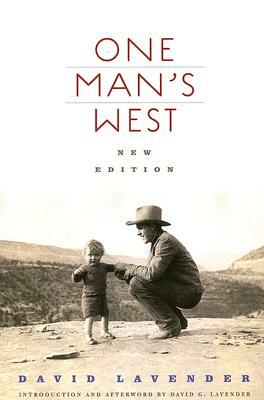 Like stories told around a campfire, One Man’s West is captivating yet conversational, incredible yet realistic, and introduces some of the most charming characters in western literature. This new Bison Books edition features an introduction and afterword by the author’s son that discuss other phases and facets of his father’s remarkable life, as well as a tribute to the author by his grandson. It also includes nine new photographs from the Lavender family archives. David Lavender (1910–2003) was a historian of the American West whose many books include The Way to the Western Sea: Lewis and Clark across the Continent, Westward Vision: The Story of the Oregon Trail, and Bent’s Fort, all available in Bison Books editions. David G. Lavender is the author’s son and David W. Lavender is the author’s grandson.